SAN DIEGO — There is no shortage of superheroes in mid-July in San Diego. When Comic-Con takes over the San Diego Convention Center, you can walk down aisles jam-packed with booths and bodies and easily count five Dr. Whos, three Wolverines and that one guy in an ingenious Transformers costume (you can even get your picture taken with the hulk, Lou Ferrigno). Among all the fantastical figures parading down San Diego’s streets this year, there was also an elegant and modest man who has earned the moniker “hero” in real life. John Lewis was born the son of sharecroppers in rural Alabama. When he got old enough, his parents demanded he worked on the farm, instead he hid under the porch so he could sneak out to the waiting school bus and get an education. Lewis went on to be known as one of the big six of the civil rights movement, starting as a leader organizing student run sit-ins at segregated lunch counters in Nashville. Lewis kept going, becoming chairman of the Student Nonviolent Coordinating Committee, known as SNCC. He spoke alongside Martin Luther King Jr. at the March on Washington. He was one of the original freedom riders, enduring bombings and bodily beatings. He has said that in the course of his non-violent protests, he sometimes felt he was going to die. March 7, 1965 was a day that came to be known as Bloody Sunday in Selma, Ala. Police fractured Lewis’ skull as he led 600 protesters across the Edmund Pettis Bridge. He made it across the bridge, but he still bears the scars of that beating to this day. However, this summer, the 73-year-old congressman was welcomed at Comic-Con in a completely new role — a comic book author. Every superhero has an origin story, and John Lewis’ is no different, but it turns out that “March,” the first in a series of three graphic novels that chronicle the congressman’s life, also has a story. It began with a young man who was working on the Congressman’s 2008 re-election campaign. Andrew Aydin was 26 at the time and he said he expected to be mocked by his fellow campaign workers when he came out as a geek. “It was towards the end of the campaign as things were winding down and folks started to talk about what they would do after, and unashamed I said I would be going to a comic book convention — and there was a little teasing,” Aydin said. What Aydin didn’t expect was for the congressman to come so rapidly to his defense. 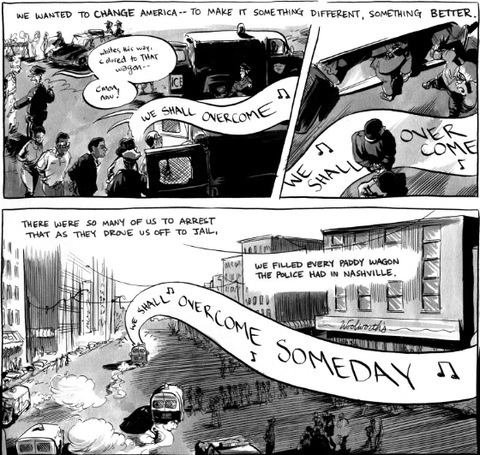 That inspirational comic book was 15 thin pages of colored newsprint that depicted the protest sparked by Rosa Parks’ 1955 refusal to give up her seat on a public bus. Yet, it wasn’t just a comic book, it was a primer on non-violent protest. It was the lessons of the book that Lewis and his fellow students put to use as they planned sit-ins at segregated lunch counters across the south in the late 50s and early 60s. In standing up for Aydin, Lewis was doing what he always did, looking out for the little guy. But Aydin, a self-professed fan boy, instantly became obsessed with the role the historical comic had played in non-violent protests among youth during the civil rights movement. For Aydin, the next step was clear — Lewis should tell his story in a comic book. Rep. Lewis, it turns out, was not as easily convinced. It wasn’t really a hard sell, and Aydin was unrelenting. Aydin went to work for Lewis in Washington and he began to take notes. He recorded the congressman’s stories in between meetings, or while waiting for flights or trains, and from these anecdotes, he began to weave together a narrative that would become the graphic novel. “For so long this has been a project that existed in email, and on my couch, and my dog trampling over the script pages that have fallen on the floor,” Aydin said. Andrew Aydin is the first to admit you can’t really grasp John Lewis without understanding his love of a certain bird. “I don’t think you can start telling John Lewis’ story without the chickens. If you ever go to his office, this is such an integral part of his story,” Aydin said. Lewis’ congressional office is replete with chicken iconography, but it harkens back to his earliest memory of being in charge of the birds on the family farm. These were the first creatures he cared for, and he did it with a stubborn love that finds a deep echo in his embrace of the ethos of non-violent protest. He loved his chickens with ease and went on to love his oppressors and tormenters and those who beat him with the same kind of stubborn, unrelenting love. The chickens were his first congregation, and he practiced preaching sermons to them; they were literally his flock. Long before those that gathered to hear him at the March on Washington, the chickens were his rapt audience. There is a memorable moment in the graphic novel, where Lewis decides to baptize the baby birds. He takes a small chick and dunks it in the water for the ritual, but the chicken goes limp, and he realizes he may just have killed the helpless fowl. He lays the baby bird in the sun, praying to God that it might live again, and like a miracle the chick awakens, clucking back to life. For the young Lewis, this isn’t a narrow escape or a simple story of resurrection. Instead, it becomes a lesson about hubris, and about trying to control the fate of another creature too completely. It is these intimate, human moments of learning to love on a farm that gave graphic artist Nate Powell a pathway to tell the congressman’s story in pictures. Powell said because he began drawing the congressman’s life story from the point of view of a child, the differences sometimes faded away, and he said that is a way for the reader to enter into the narrative as well. Photo courtesy of Top Shelf Productions. “There were certain moments free of context where I felt like I could slip into his shoes for that second and I precisely know what it was like to witness the baptism of these chickens, the loss of a beloved hen down a well, hiding under the porch so that he could sneak away from his house in order to get an education each day and hop on the bus with his mom chasing after him,” he said. That intimacy is evident in the shadowed, up-close visual perspectives that mark the early parts of the book. But Powell said there were moments where illustrating the story did give him pause. “I will hit a certain milestone within the narrative, like trying to find the appropriate and powerful way to respectfully depict the murder of Emmet Till,” he said. Till was a 14-year-old African-American boy from Chicago, who on a visit to Mississippi spoke to a white woman and was subsequently murdered. Powell said despite difficult moments of entering into painful national tragedy, he kept drawing out the story, even as the narrative turned from a child’s perspective to the front lines of history. While “March” covers a great deal of the history of the civil rights movement, its creators say it isn’t just a retelling of what has come before. Just like the comic book that inspired it, “March” is meant to be a primer to a new generation of the power of non-violent protest. That message is something co-author Andrew Aydin said was never far from his mind. Lewis is the first to admit that so much has changed since he fought on the front lines for civil rights. He said the strides have been great. It is a big enough down payment to have become the framing narrative in which the graphic novel nestles the story of Lewis’ rise from sharecropper’s son to congressman. The story of “March” is bookended by the day of President Obama’s inauguration. Still, Lewis said, the journey to civil rights is a road that still needs to be paved. “Too many people, even today, even in the 21st century, have been left out and left behind,” he said. Lewis said it is no longer about the color of one’s skin. “They are black, they are white, they are Latino, they are Asian-American and they are Native American,” he said. That restlessness is born out in the time of Trayvon Martin and the recent Supreme Court decision on voting rights, according to Lewis. The congressman said just like he walked over the Edmund Pettis Bridge, he wants to build a bridge that connects young people to the greater struggle to civil rights and non-violent protest. As he looked to the past to find the future, Lewis’ face filled with emotion. “I remember hearing Martin Luther King Jr. preach from time to time and his father would be in the pulpit and he would say ‘Son, make it plain, make it plain’ — so between Nate and Andrew, they made it plain,” he said. And nothing is plainer than a picture. But a picture, they say, can also tell a thousand words. “March” premiered at Comic-Con. It is available now in bookstores. This story was reported by KPBS in San Diego.